After a week of brutal heat, today we have a slight break. It will only be 90 today, humidity 68%, feels like 102. A storm last night brought some much-needed rain, although in temperatures like this, moisture evaporates from the ground rapidly. I finished extending the drip irrigation and topped off the mulch. Everything (except me) looks just a bit fresher. My pickles turned out not too bad. I feel that the recipe I used is a good starting point. I used an off-the-shelf pickling spice but it is heavy on the cloves. I am thinking of mixing up my own, or at least picking out the cloves until I have used up this batch. I have tiny peppers on my jalapeno and anaheim plants. 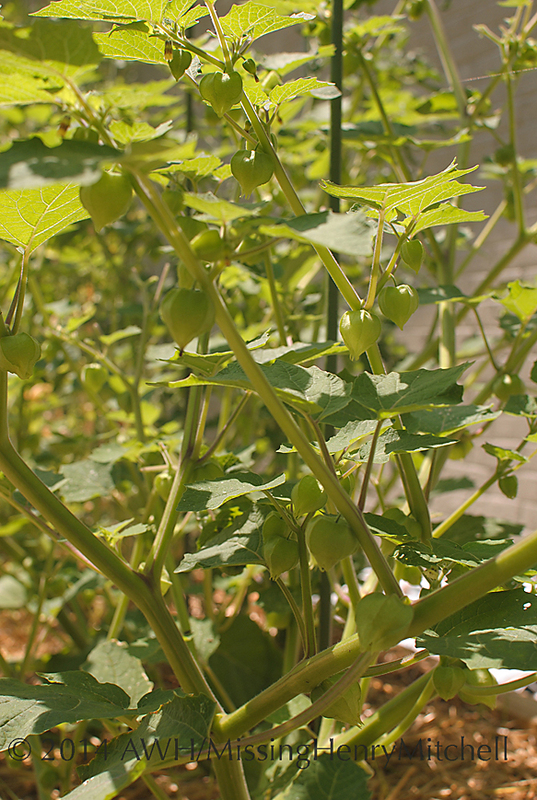 The ground cherries are now about 4′ by 4′ and covered with little paper bells where the fruits will form. They shade the lettuces well; I can’t believe the lettuce hasn’t collapsed completely in the heat. And most peculiarly, the peas are hanging on for dear life. I think I must get ruthless and cut them down in the next week or so–they’ll only get sad as the summer goes on, and I could use the real estate in the bed for something more productive. 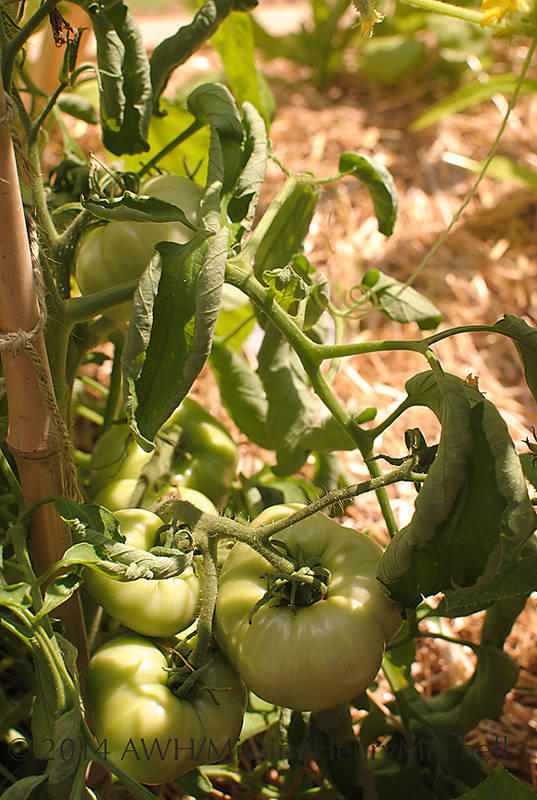 Tomato ‘Principe Borghese’ is great for drying. 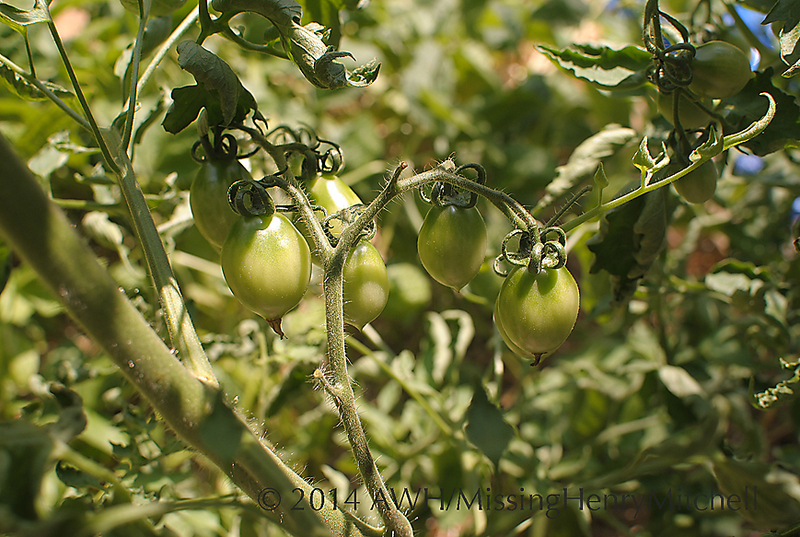 Tomato ‘Sophie’s Choice’ is a short-season variety. Hope you are well and that your garden is flourishing. This entry was posted in 2014, Dear Friend and Gardener, Edible Plants, Garden plants, Jams, Pickles, and the Like, Recipes, Vegetables, Writing and tagged gardening, grow your own food, homemade pickles, summer gardening, tomatoes, vegetables by missinghenrymitchell. Bookmark the permalink. Thanks! I hope things dry out for you. I am sure your zucchini will flourish–take photos! Our season is very different, but we are starting to come along. Yesterday I was at a retirement party and one of the gifts for the retiree was a bag of cucumber because she is so famous for her pickles, but they had to be store bought cukes.